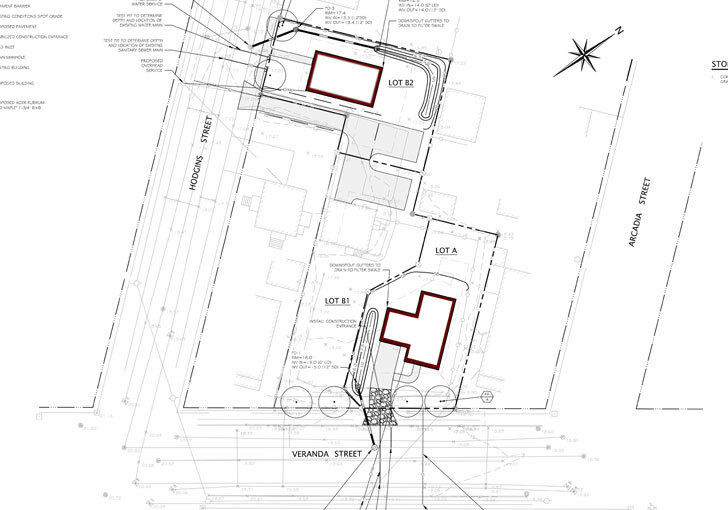 To revise a set of previously designed plans to divide one residential property lot into three. Provide a review of site constraints to determine an alternate layout from original plans submitted, prepare a rough sketch of revisions, determine regulatory feasibility with City staff, and prepare revised drawings, and drainage report as necessary to fulfill the client's objectives. The original site was approximately 18,094 ± square feet with a two-story, single family structure featuring associated driveway and walks. The owner has subdivided the property into three separate, single-family lots; one with the existing single-family home and the remaining two will have single-family structures constructed with associated driveways and site features.